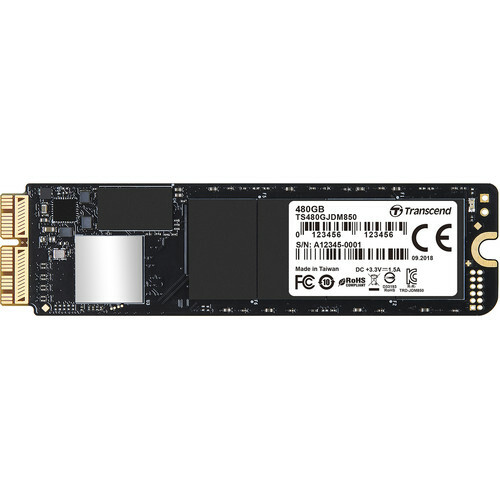 With the 480GB JetDrive 850 PCIe Gen3 x4 SSD from Transcend you can supercharge your MacBook Pro, MacBook Air, Mac mini, or Mac Pro with ultra-fast memory that not only increases your computer's storage capacity, but also helps enhance overall system performance. This JetDrive SSD uses the PCIe Gen3 x4 interface to deliver data read and write speeds of up to 1600 and 1400 MB/s respectively so you can access files quickly. Included with the drive is the JetDrive Toolbox, which helps keep your SSD up to date, prevents functional degradation, and can even help predict problems before they happen. Note: Warranty does not apply when JetDrive Toolbox's wear-out indicator displays 0% within the warranty coverage. Box Dimensions (LxWxH) 6.8 x 3.8 x 1.4"